Residents and merchants often overhear visitors saying “this is such a quaint town!” But what makes Mount Victory “quaint” and inviting is by no means an accident. The village was platted in an 1800’s style that has come to be defined by architects as Traditional Neighborhood Design. 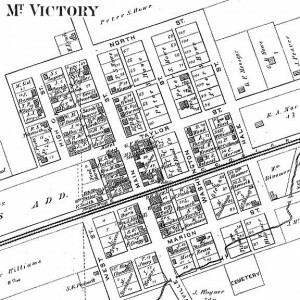 The principles for this style of town planning were simple and straightforward – hundreds of towns in Ohio were laid out in a similar way. Most folks don’t give much thought to these physical characteristics – they just know there is a distinct difference between an older town and a newer suburb. But it is this difference that makes Mt. 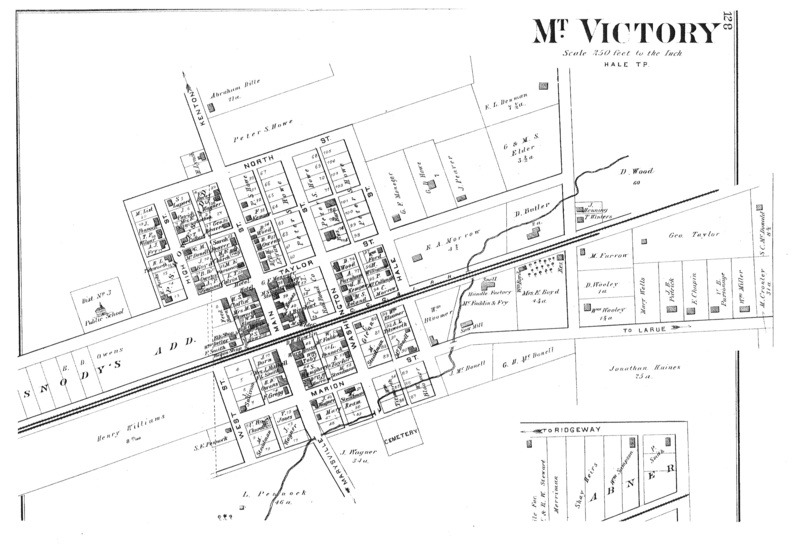 Victory a quaint historic village – these characteristics equal a human scale that charming. (imagine if Disney’s Main Street looked like a suburb instead of a historic Main Street… and you start to get the idea). Residential properties were laid out in a rectangular pattern. Each rectangle a separate property division. Most were and still are 1 chain x 3 chains. A ‘chain’ is an early measurement used in land descriptions that is equal to 66 feet. Most all properties – even those on Main Street – are 66 ft. wide by 198 ft. deep. Plots were designed back to back with a service alley between them. Then a standard street in the front that was 1 chain (66 ft.) wide. The irony is that many property developers have stopped building standard suburbs and started using the TND formula instead. The advantages include dramatic reductions in the consumption of open space; better long term health and sustainability for neighborhoods; dissipation of conflict between developers and residents; increased mobility choice for residents (especially children, seniors and those with physical limitations); improved air and water quality; a heightened sense of community and civic pride; the list goes on.